With the signing of the revised International Health Regulations (IHR) in 2005, the international community agreed to improve the detection and reporting of potential public health emergencies worldwide. The revised IHR better address today’s global health security concerns and are a critical part of protecting global health. The regulations require that all countries have the ability to detect, assess, report and respond to public health events. CDC is currently working with countries around the globe to help meet the goals of the IHR. CDC’s global programs address over 400 diseases, health threats, and conditions that are major causes of death, disease, and disability. Our global programs are run by world leaders in epidemiology, surveillance, informatics, laboratory systems, and other essential disciplines. Through partnerships with other countries’ ministries of health, CDC is improving the quantity and quality of critical public health services. The IHR are a framework that will help countries minimize the impact and spread of public health threats. As an international treaty, the IHR are legally binding; all countries must report events of international public health importance. Countries are using the IHR framework to prevent and control global health threats while keeping international travel and trade as open as possible. The IHR, which are coordinated by the World Health Organization (WHO), aims to keep the world informed about public health risks and events. U.S. government agencies have just 48 hours to assess the situation after learning about a public health emergency of international concern (PHEIC). 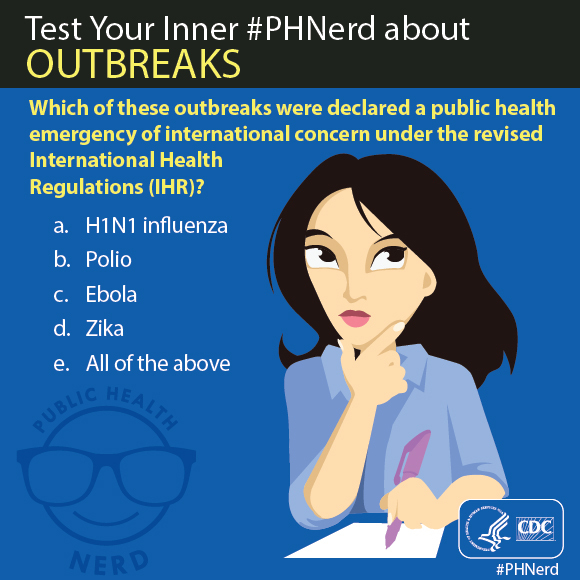 Find answers to more questions about how the IHR have changed the way we handle outbreaks and other public health threats. In today’s interconnected society, it’s more important than ever to make sure all countries are able to respond to and contain public health threats. In 2003, severe acute respiratory syndrome (SARS) threatened global health, showing us how easily an outbreak can spread. Recently, the Ebola epidemic in West Africa and outbreaks of MERS-CoV have shown that we are only as safe as the most fragile state. All countries have a responsibility to one another to build healthcare systems that are strong and that work to identify and contain public health events before they spread. While previous regulations required countries to report incidents of cholera, plague, and yellow fever, the revised IHR are more flexible and future-oriented, requiring countries to consider the possible impact of all hazards, whether they occur naturally, accidentally, or intentionally.2 The IHR cover all events that might potentially become a public health emergency of international concern (PHEIC). The GHS Agenda provides 11 clear targets which will serve as a road map to help countries create systems that are able to prevent, detect and respond to health threats. The GHS Agenda recognizes the challenges countries are facing, laying out practical and concrete steps countries can take toward strengthening their health systems, as well as ways in which countries can support each other. One of the most important aspects of IHR is the requirement that countries will detect and report events that may constitute a potential public health emergency of international concern (PHEIC). Once a WHO member country identifies an event of concern, the country must assess the public health risks of the event within 48 hours. If the event is determined to be notifiable under the IHR, the country must report the information to WHO within 24 hours. May include cholera, pneumonic plague, yellow fever, viral hemorrhagic fever, and West Nile fever, as well as any others that meet the criteria laid out by the IHR. 2014 and 2015 have been unprecedented years for potential PHEICs.9 In the months from January 2014 to February 2015, 321 possible PHEICs were reported to WHO.10 WHO posted more than 400 updates and announcements on their event information site for National IHR Focal Points, relating to 79 public health events and regional updates. Most postings concerned the Middle East respiratory syndrome coronavirus (MERS-CoV) event, the influenza A (H7N9) virus event in China, and the outbreak of Ebola in West Africa. When a PHEIC is declared, WHO helps coordinate an immediate response with the affected country and with other countries around the world. The idea that a health threat in one part of the world can impact other parts of the world is not new. Over time, there have been a series of agreements between countries to address the potential spread of disease, beginning with the International Sanitary Convention in 1892 and continuing until today with the International Health Regulations11. The IHR were originally written in 1969, and were revised in 2005, following the 2003 epidemic of severe acute respiratory syndrome (SARS). After the SARS epidemic, it became clear that stronger systems were needed to detect, assess, report, and respond to public health events. The revised IHR entered into force for the United States on July 18, 2007. In the U.S., CDC works with state and local reporting and response networks to receive information at the federal level and then respond to events of concern at the local and federal levels. The Department of Health and Human Services (DHHS) has assumed the lead role in carrying out the reporting requirements for IHR (2005). The Health and Human Services’ Secretary’s Operations Center (SOC) is the National Focal Point responsible for reporting events to WHO. WHO.Implementation of the International Health Regulations (2005) [662 KB, 14 Pages].